Grade Level: Pre K-1st Summary: This book is great for rhyming and could make the children giggle. Many songs to choose from and many written with wacky words throughout. This book would be great if there was an additional tape or way to have live music incorporated with the songs, this was the tune would be known and the songs could be sang to full effect. Review: Some of these songs seem great and others were a lot less appealing to me. Some of the songs don't make much sense to me so I am not quite sure how they would transfer to the children. Either way I think this book is colorful and fun and could be a great addition to a classroom. In Class Use: You could use songs such as "the yawn song" before they go down for a nap in a pre-k or daycare environment. You could also use them as a silly way to spend free time and create movement and dance into the classroom. I do not own a piano, and I am not known to read music in a way that makes me capable of singing (that is, I can read music to play instruments). I checked this out purely because of my efforts to read all Seuss books. And so I read it. It's cute. Might be fun for a kid who does play the piano. Not an easy book to find, tho. A 1967 collection of songs written by Dr. Seuss are masterfully arranged by composer Eugene Poddany, who gets an awfully small billing for this book considering the quality of the music, especially the harmonies (yes, I am a musician).All the songs are brilliant. This book also marks the completion of a quest - to read everything Dr. Seuss ever wrote that still exists in print. Fantastic book for kids! So imaginative and creative. Easy read that children will find delightful!Dr. Seuss is always brilliant! His stories and rhymes are fun and entertaining! Some of my all time favorites!! Such a great way to entertain children and get them interested in reading! An illustrated songbook with sheet music for piano and guitar. Songs are fun and nonsensical. The only thing I wish was included was a CD. For musicians, this would be a fun addition to a Seuss program. Sing along with Dr. Seuss. This book has great funny songs. You will be laughing out loud and so will your students !!! 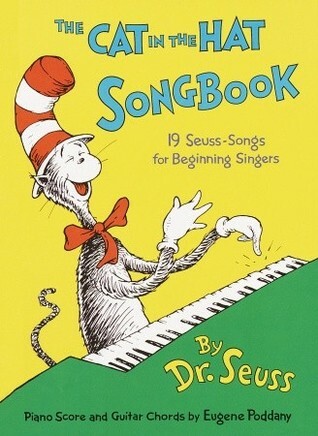 My favorite book ever when I was a little kid singing all the songs in the book. I have an original blue version. This is an awesome edition to any Dr. Seuss collection.